Now that your baby is all cuddled up close to you, review this list to make sure you have placed your baby correctly and safely in the carrier. Keeping this list in mind every time you wear your baby will ensure a happy, safe and comfortable experience for you both! 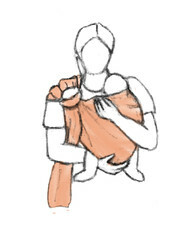 The classic “tummy to tummy” carry can be used for newborns to toddlers. 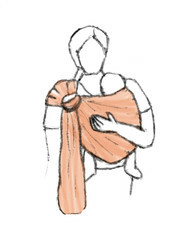 For the very young babies, you can leave their feet tucked in or out of the Ring Sling carrier. 1. 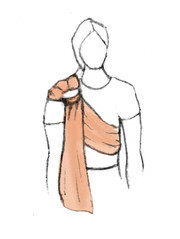 Put the rings atop a shoulder of your choice and grab the other end, so the sling runs diagonally across your back. Pay attention that the rings are located higher than your chest, since they're going to be dragged downwards when tightened. 2. Lead the end of the sling through both rings from beneath. 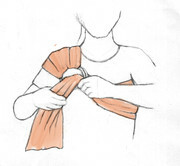 Make sure to arrange the sling neatly and evenly without too much interleaving, similar to an accordeon. 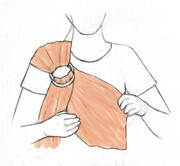 This makes adjusting the sling in the last step much easier. 3. Hold both rings apart and pull the fabric through - over the ring above and beneath the ring below. Now you can tighten the sling to create a bag. This is ought to be barely big enough to place your baby inside. 4. 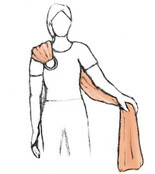 At the start, the rings of the carrier should be high on the shoulder. 5. Now, the baby should be laid on the opposite shoulder from the rings. Reach under the fabric of the created bag to grab both feet. 6. 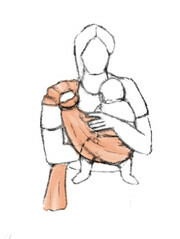 Sit the baby gently down securely, holding it with one arm, controlling the fabric with the other, pulling the fabric between the baby’s legs into its back of the knees for a safe, deep seat. 7. 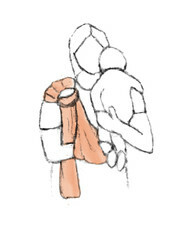 Pull the fabric up the baby’s back and make sure that it has its bum below its knees with froggy legs down. 8. 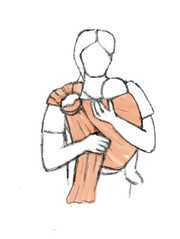 Tighten the carrier by pulling different parts of the tail across your body to tighten each part of the carrier along the baby’s back. 9.Now you are ready to go: Your baby is properly placed into the carrier when you can make sure of all safety tips. Find our frequently asked questions here. Exchanges or Returns?Click here for instructions and information.